Bebob batteries aren't disposables but durable equipment. When the capacity has become insufficient after years of use, batteries can be easily re-celled in our factory – for about half the price of a new one. In addition to the fuel gauge, bebob CINE batteries are fitted with a Status Alarm. When the battery becomes older and its total capacity goes beyond 80%, the LED alarm lights yellow, under 60% red. This way, you always know about the capacity of your batteries and can decide upon their refitting. Only bebob batteries provide the unique bebob Twist-D-Tap. This rainproof socket allows you to plug a D-Tap connector into the battery with free choice of cable trailing from the left or right. 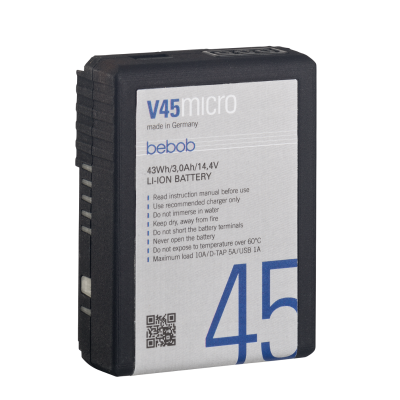 Bebob batteries offer you an USB Port (5V 1A) to connect any USB powered device. So you can charge your smartphone or tablet directly on location! All bebob products are certified following the legal reglementations – like CE, UN, GVV, UL, FCC/EMV.